BC Liberals Pat Pimm and Blair Lekstrom have proposed a delegation agreement for the Peace River Valley, a move that is intended to free them of political responsibility for development of the fertile farmland in a region that represents 1/3 of British Columbia’s Agricultural Land Reserve, and effectively deprives the taxpayers of voters of British Columbia from any say in what happens to the farmland. Shortly after getting elected, the BC Liberals entered into a delegation agreement with the oil and gas industry that has allowed the industry to engage in natural gas exploration that has effectively poisoned large areas of ground water with no deference to the people, livestock or wildlife that rely on those water resources, despite the fact that many areas of BC’s interior, Kootenays, Cariboo and norther region already experience drought conditions that may likely increase as a result of global warming. When the Agricultural Land Reserve was created in 1973, the Agricultural Land Commission was created a provincial body to relieve farmland from the direct pressures imposed upon local governments by local industries and developers. The BC Liberals have slashed the ALC’s budget by more than 1/3, robbing the Commission of the staff and resources to deal with the increasing flood of applications resulting from Cabinet’s signals that BC’s farmland is available for the taking. With diminishing resources to do its job well, the ALC sees in such delegation agreements an opportunity to hand off some of its work. By handing power back to local governments or special interests, delegation agreements effectively reverse the safeguards put in place in 1973 to preserve BC’s farmland for the food security of future generations. The proposal by Pimm and Lekstrom is sure to send chills down the spines of the people of the Peace River Valley and farmland and food security advocates across British Columbia. 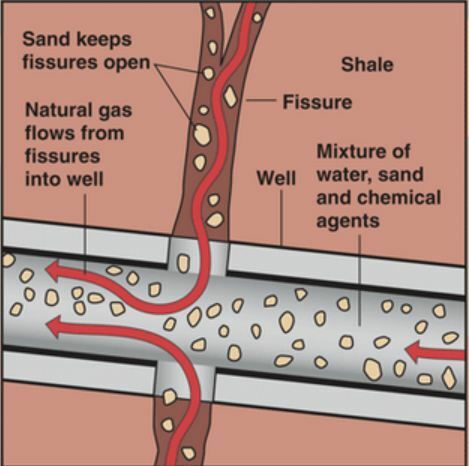 Blasting shale rock with toxic fluid can release riches in natural gas, but threatens critical water supplies. I think Donna needs to do some research on this first to get her facts straight!! The ALC is not delegating this responibility down to a delegation. This is not a political move at all.The MLA’s are working on behalf of what the farmers/landowners in the Peace want as they have heard for years the inefficiences in the system in our area, making decisions closer to home instead of heading to Victoria.Victoria has no idea what our local issues are and speeding up the process in the meantime. Any decisions made by the delegation have to be within the parameters of the current legislation, just made at a regional instead of provincial level.The delegation would will be made up of landowners and people who are directly affected. Currently it is only an ask, from the MLA's on behalf of farm and landowner organizations, to the Chair of the Commision to have it looked into, we are far away from a delegation agreement, if one will be decided on at all! Janet Banman's comment published April 21 after it inappropriately spent 48 hours in the spam filter. I think this is more a disagreement of opinion than a inaccurate fact gathering. Donna is looking at the larger picture, with particular knowledge of actions in BC's lower mainland to subvert the ALC. A drive through the lower Fraser Valley demonstrates how the province's best farmland has been and is being consumed by development. It is not coincidence that real estate developers are among the largest contributors to the BC Liberal Party. They've tendered millions to the BC Libs and have made billions in return. The process is thoroughly corrupt in southern BC. Little wonder that Donna Passmore is concerned about changes that threaten the original ALC objectives.